Professional writers have CPD just like any other profession. There's craft as well as art; words should be used like a sniper's bullet (every shot counts) rather than a blunderbuss (KERBLAMMO! with everything you've got and hope a pellet hits). 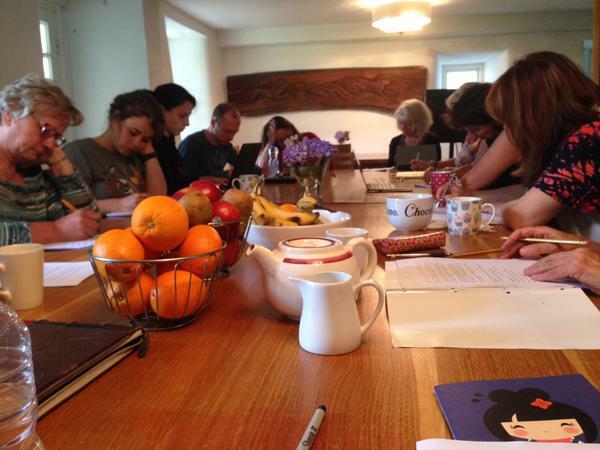 Although I learn from the many fantastic editors I work with, I also regularly attend writing courses. I listed some of them here; others here; and my course at Tŷ Newydd last year. Well, I've just got back from this new course at Tŷ Newydd. Women’s popular fiction accounts for an enormous percentage of the adult fiction market, ranging from the commercial to the literary, from contemporary comic romance to multigenerational sagas and historical fiction. Women’s fiction is about the woman’s story, her hopes, fears, fantasies and empowerment, whether it ends happily or in a tragedy. You might think it's a strange course for me to pick if you've only read my survival horror novel Turner, but in reality I often write from a female perspective, and for a mixed audience. In Cold Fusion 2000 all the key characters (apart from the clueless protagonist) were women; my new novel 2000 Tunes has male and female protagonists, and I love them both equally. I didn't love Arriva Trains when I tried to get to the course on Monday though. I waited on the platform. The train didn't come. Even though the staff knew it wasn't running they only announced the cancellation after the train should have left, leaving little time to come up with Plan B. There were no announcements about alternative arrangements. I had to waste more time queuing to speak to someone in the ticket office. I asked how to make my connection, what plans were in place for when they fail to provide the train they sold a ticket for. "Why didn't you tell me you'd changed your policy when you sold me this ticket last week?" I racked my brains and set a crazy plan in motion. Jumped into a taxi, asked if they could get me to another station in time for my connection. The driver said probably not - if I'd come five minutes earlier, then maybe... but sod it, we set off anyway. I gave him all my money and started running down a path in the middle of nowhere with my guitar and heavy bag, no idea how far it was or if I’d gone the right way, splashing through puddles. The train had probably already long gone, but I was being stubborn now and didn’t stop. Maybe it was a mile. Eventually saw something ahead that might be a train station, and a train approaching. Ran faster, crossed the track, sprinted to the end of the platform. 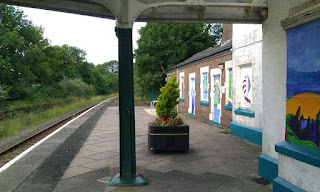 And I made it, because the other Arriva train was running 10 minutes late. I was grinning like mad. The ticket collector said no-one had ever been pleased with him for the train running late before. I got to Criccieth and walked to Tŷ Newydd. So a bit more stressful, and an extra £25 that Arriva won't refund, but I was there, walking up a tree-lined avenue to the grand house for the second time. I met the whole lovely group later. I was the only man. After an evening meal and wine we went to the library to get to know each other and talk about women's fiction. We'd all been asked to bring something to talk about: my selection was The Yellow Wallpaper. It was interesting to hear about other works, and why they'd been selected, what made each book's creative fingerprint unique. The next day was the beginning of the course proper. This was the structure of my typical day there. 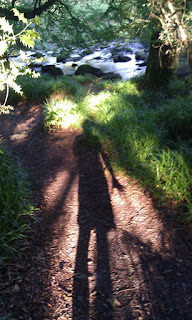 Me by the river, or Nosferatu? Run. Get up early and go for a run. My favourite route was along the river, so peaceful and beautiful. If you're spending a lot of time sat down you need to shake things up. Group writing sessions on many useful topics. Rowan covered things like characterisation and creating emotion; Julie covered plotting and re-writing, amongst others. Post-It notes were used liberally as analytical tools. I also had a one-to-one with Rowan which went well: I showed her a page of one of my short stories, about a difficult pregnancy, and she read it all because she wanted to know what happened at the end (which is always flattering); this led to a really useful discussion of writing styles and voice in stories. Solo creativity. Afternoons I would usually practise playing my guitar in the garden before heading off to the library with coffee to do some writing and editing. I got the first draft of a new story written, about a woman obsessed with winning at any cost. Food. We all got together again for an evening meal. As a vegan I sometimes wonder whether I'll get anything good when going to a new venue but there was no problem here - always plenty of food and variety, lovely soups, salads, hot meals, fruit and snacks. I really looked forward to mealtimes. Evening. The day would end with us all meeting in the library for discussion or readings. On Wednesday our guest was Katie Fforde and we learnt a lot in the Q&A with her, she was so friendly and open and full of good advice for writers. On the last night I read out one of my stories (Sweet Nothing) which upset some people, but in a good way, I think - the next day there were many nice comments about how I'd created sympathy for the little boy in the story. 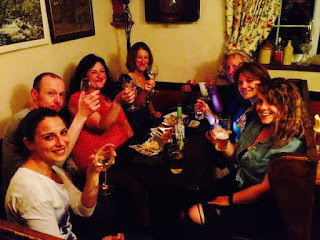 A few of us in the local pub. Iechyd da. Even though I was the only man on the course I was welcomed, and treated as an honorary woman. Which sometimes left me in stitches at the discussions round the dinner table after we'd started on the wine. I'll never look at cupcakes and bras in the same way again. Julie and Rowan were lovely, supportive, knowledgeable, and funny, which is everything you would want in a tutor. My fellow course participants were totally different in terms of backgrounds, writing interests, personalities, and ages, yet I always felt like we were a group, and a supportive one at that. The key thing is that, regardless of genre, we're all writers. We're trying to achieve the same thing: using words to tell a story that creates emotion of some kind, that says something about life. We all use structure, we all create worlds, we all want to pull the reader in and keep them gripped in an iron fist of compulsion. So I'd like to say this to other guys: you should go on all sorts of courses, it really helps to round out our writing! Writing is communication. Communication is central to all relationships. Relationships connect us to each other and to every thing. Finally, many thanks to Literature Wales for running the really useful and inspiring course. I've always had a good relationship with the organisation, since way back when they were called Academi (I've got an entry in The Writers of Wales Database). They also run the prestigious Wales Book of the Year Award to highlight the best of the many great books written in Wales or by Welsh authors every year, though they currently exclude independently-published books (something that is only revealed in the small print). I'd love to discuss the possibility of them opening up the prize to include all quality books by Welsh writers, which would then make Wales Book of the Year a truly all-encompassing award. 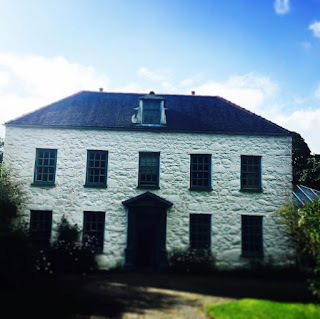 In the meantime, if you are a writer then make sure you have a look at their site: there are lots of tips for writers in the sections here and here, information on awards and grants, and, of course, the lovely and transformative Tŷ Newydd courses. Hope you got back home safely: my journey seemed very long once I'd waved you off. Your blog's right: we were a diverse group with different aims and ambitions but we're all writers and that's the glue that kept us together. And there is a group of poets sitting around the table. I hope they'll have as good a time as we did.